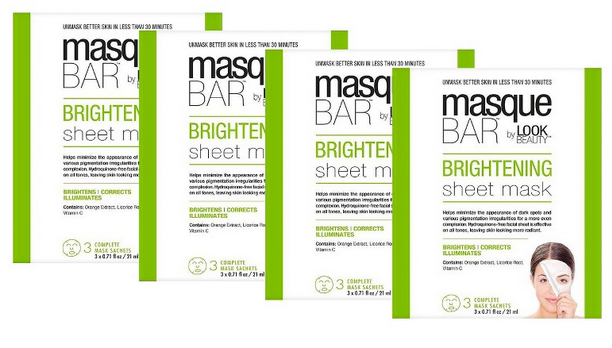 It's my understanding that this product came out spring of this year, but I recently heard about the Masque Bar by Look Beauty when I saw it advertised in my September issue of InStyle. This is a facial sheet mask that comes in five treatments: brightening, firming & lifting, wrinkle reducing, pore refining and anti-blemish. I chose the Masque Bar by Look Beauty Brightening Sheet Mask because it specifically treats dark spots and provides an even skin tone. I bought it at Target for $9.99 for a pack of three sheets. The sheet is hypoallergenic, unscented and easy to use. First you cleanse your face and dry it. Then remove the sheet from the packet and lay it flat on your face so it fits securely. The mask comes with holes for your eyes, nose and mouth, of course. All you do is leave it on your face for 20-30 minutes and then peel off. I suffer from dry skin, so it was great that my skin did not feel tight after I removed the mask. It actually felt pretty smooth and soft. Three of the main ingredients are water, orange extract and Vitamin C. My favorite thing about this product was that it was a mask that I could easily apply and remove. I've only used it once so although my skin felt good, I can't yet say that my dark spots are gone or that my complexion is more even--at least not until I use the other two masks in the packet. Overall, I would definitely continue to use this brightening sheet mask to continue to see results. Oh, Cheryl, you're so cute :)) I don't think I've seen another vlog post of you and this was so much fun! Agree with the comments above, Cheryl:) You sound so adorable, and great review! You should do more vids like this. Not awkward at all! Lol, I was expecting some kin of a pro voice, but you sounded so lovely, a bit shy and natural in this video,Awwww.. so cute. Am very sure you are a lovely person. Great review on this mask.The after result was so obvious despite the light flashing on your cute face.And congrats on your first video,Wowwww.. you've got balls. Fabulous and very thorough review, darling! I would definitely try these, especially because my skin can be a bit dry also and I need something that won't zap it of what little moisture it has! It's shaped just like Korean masks! It covers the entire face. I love the price and the fact that you get 3. With Korean masks you usually just get 1. Keep us posted on the results or update this post. It looks like it does a great job. Would be very interested in knowing if it helps with dark spots. Great job Cheryl! That mask looks a bit funny.=) Sounds pretty good though. Sheet masks are so fun! I'll have to see if I can get these when Target opens here. 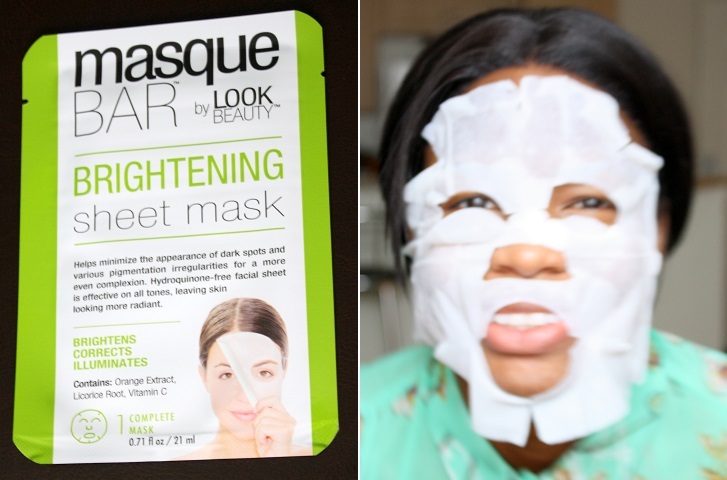 Hoping the mask gives you the results you want. I've actually been meaning to try the Garnier product for dark spots. Lovely outfit. That skirt is gorgeous. I will have to give this a try because my skin can get dry most of the time! I like that you have to share some beauty ideas too. I was planning to share my hygiene remedies sometime! Fab review Cheryl, I'm always on the look out for new products to try so will have to give this a go! Looooove your purse cheryl!! the whole ensemble! beautiful! Good video. Have to check the ingredients on the package. I really like to know what I put on my skin.